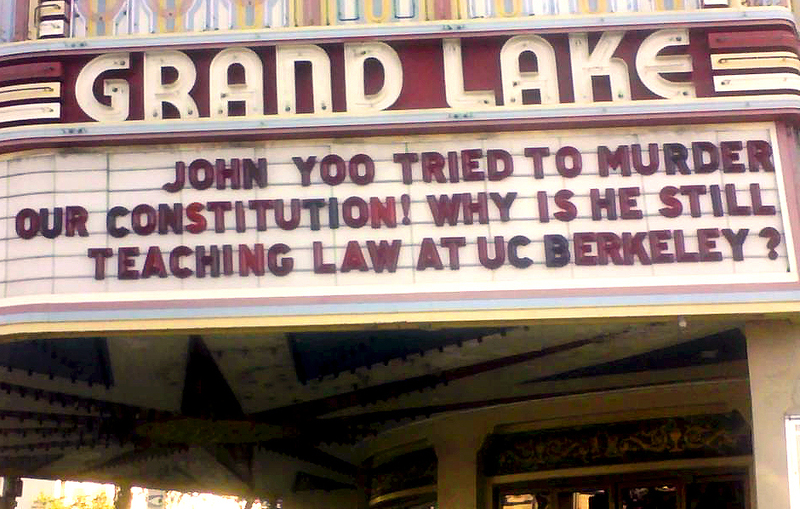 John Yoo Thinks Trump's Emergency Declaration Would Be Legal - FIRE JOHN YOO! John Yoo, principal author of the infamous torture memos that authorized waterboarding and worse in the Bush administration, says that if Trump declared a state of emergency over Mexican border immigration, that would be perfectly constitutional. ..this is the man who says the president has the legal authority to order a child's testicles crushed in order to get information from their father (yes, that's actually his position)... but that can't just mean that anything he says is an emergency actually is one. Listed below are links to blogs that reference this entry: John Yoo Thinks Trump's Emergency Declaration Would Be Legal. This page contains a single entry published on January 14, 2019 3:18 PM. CLOSE GUANTANAMO was the previous entry in this blog. Don't Forget All the Torturers and Liars Who Have Paid No Price For Their Crimes is the next entry in this blog.